Only five Syrian Christians have been admitted to the United States since October, accounting for fewer than two percent of all refugees accepted. The Worldwide Refugee Admissions Processing Systems (WRAPS), which tracks refugee resettlement, reports that three Syrian Catholics, one Christian, and one Orthodox believer have arrived in the United States since the 2016 fiscal year began in October. This accounts for just 1.6 percent of all refugees accepted, far below the 10 percent of the population Syrian Christians comprise. 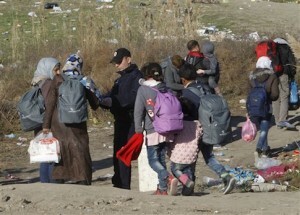 President Barack Obama plans to admit 10,000 of the 4.3 million Syrian refugees who have fled the country, mostly to Europe, since the civil war began in 2011. Following the Islamic State attacks in Paris that left 129 dead, Obama painted opponents who have called for restraint in admitting and settling the refugees in the United States as extremists. He directed harsh criticism at those, including Republican presidential hopeful Sen. Ted Cruz (R., Texas), who would prioritize Syrian Christians in asylum process as "shameful." "When I hear folks say that, well maybe we should just admit the Christians but not the Muslims, when I hear political leaders suggesting that there would be a religious test for which a person who’s fleeing from a war torn country is admitted, when some of the those folks themselves come from families who benefited from protection when they were fleeing political persecution, that’s shameful," Obama said on Monday. WRAPS collects data from the Department of State, Bureau of Population, Refugees, and Migration, as well as the Refugee Processing Center to give it the most comprehensive database of migration into the United States. Since January, 1,875 Syrians have arrived on American soil; only 30 (1.6 percent) of them were Christian, compared to 1,833 Muslims (97.8 percent). The White House did not respond to request for comment regarding the disparity between Syrian Christians and Christian refugees granted asylum. A State Department spokesman said that the disparity is coincidental because "we can't predict exactly who [among a refugee population] is going to apply" for American asylum. About 5 percent of all Syrian refugees are religious minorities, including Shia Muslims, Christians, Zoroastrians, and atheists. It is official department policy not to take religion into consideration when weighing refugee admittance, though a persecuted religious population can receive preference. "The emphasis of our refugee admissions program is on helping the most vulnerable. Many of those we are currently assisting are Christians, Yezidis, and other religious and ethnic minorities from Iraq and Syria," a department spokesman said. "It is unclear how many Christians have left the country; however, it is estimated that they make up a small percentage of the Syrian refugee population. UNHCR identifies refugees for resettlement based on vulnerability, which may include belonging to a religious or ethnic minority." Christians have been directly targeted by the Islamic State and have been branded in some cases. The administration is moving to classify some Islamic State targets as victims of genocide—a designation that would increase the chances of asylum. Yahoo News investigative reporter Michael Isikoff reported that the administration will seek such a designation for the Yezidis, an Iraqi religious minority, though Christians are not likely to clear the bar. Democratic presidential frontrunner Hillary Clinton, who served as Obama’s secretary of state from 2009 to 2013, echoed those sentiments at a Thursday press conference. "Turning away orphans, applying a religious test, discriminating against Muslims, slamming the door on every Syrian refugee—that is just not who we are," she said. The Clinton campaign did not return request for comment. The majority of Americans oppose the White House plan to resettle Syrian refugees. A Bloomberg poll found that about two-thirds of Americans support either halting refugee resettlement in the United States or only accepting Christians.